I Have Just Setup My Tropical Fish Tank, Now What? Don’t be adding all the bright, exciting fish straight away. 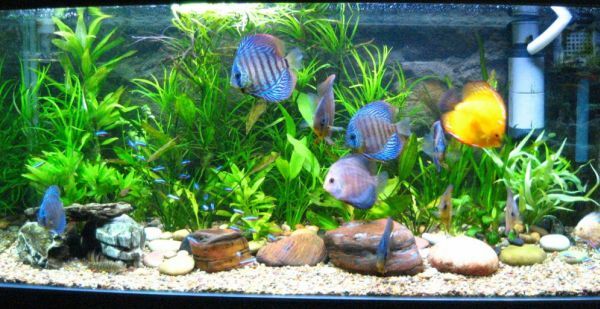 Tropical fish can have complex needs and your aquarium will need time to turn into the perfect environment. So in the first few weeks you’re probably only going to want some basic fish like barbs first. You can’t rush the tank adjusting to the nitrogen cycle. If you flood your tank with light at the beginning, you’ll get a large buildup of algae in no time. Turn the lighting on for around 12 hours at a time and use only 1 lamp if you have a florescent set up with artificial plants. Of course you will need to give the tank a little clean every now and then regardless of algae buildup, in which case products like the Flipper Cleaner from Reef Perfect are ideal. It is common for new aquarists to overfeed their fish. Your fish will be fine on one or two meals a day, so avoid killing with kindness and feed your fish sparingly. It can be easy to get bored of breaking the chlorine down in the tap water, but it’s one job you can’t skimp on. Make sure you allow time to do this properly. You should always be checking the fish to see if they are in good condition. If you spot issues quickly, you have more of a chance of dealing with those issues before they cause big problems. Some aquarists opt to have a hospital tank set up to hold ill fish and keep them separate from the main community. This isn’t necessary when you’re new to keeping an aquarium, but could be considered as an option once you have a more elaborate set up. Use aquarium water when you clean the filter and similar parts. If you use regular tap water to clean these parts you will more than likely kill any useful bacteria you have cultured. There is a lot of electricity used to run a big tank, which leaves you open for some pretty horrific electric shocks. If you need to put your hands in the water for any reason, turn the electrics off. It is important you protect your plug socket from water dripping down the electric wire from the tank. It’s easy to do this, you simply make sure the wire from the tank drops below the plug socket so it is curved towards the floor before going back up towards the plug. It is tempting to continually change every aspect of your tank every time you suffer a disaster. If you do make any changes, space them out over long periods of time otherwise you could damage all the good things about your tank. It takes time for the aquarium to become stable and if you keep changing everything it will never have a chance to settle properly. It is so easy to go into setting up a tropical aquarium full of enthusiasm and excitement, only to be left devastated when you lose your first precious fish. Unfortunately, it is more than likely that the first fish in the tank will live a full but short life. So don’t bother naming them and making cooing noises, they won’t be around for very long – it’s sad but true. Don’t be downbeat, just crack on and look forward to the future. Once the tank has been established for a while future fish will last longer, and will be worthy of you naming them. Remember, there’s no right or wrong way to cultivate the perfect tropical fish community, a lot of it is trial and error. So keep calm and carry on, you’ll enjoy success in no time!